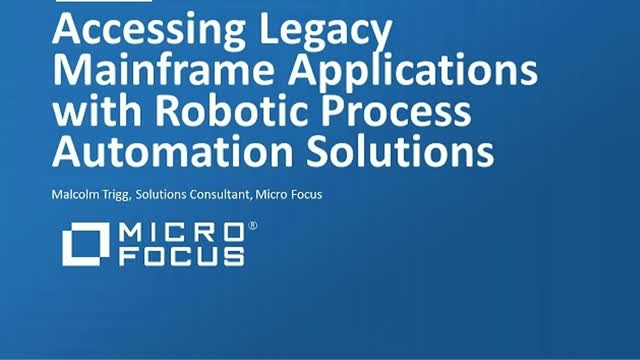 Malcolm Trigg, Solutions Consultant at Micro Focus, explains how Robotic Process Automation (RPA) products can access legacy mainframe ‘green screen’ applications and automate core business processes. This 10 minute overview will give a bitesize look at the challenges, approaches and solutions available when using RPA, and Malcolm will be available to answer viewer questions after. Everyone assumed it couldn’t be done. “It’s too risky, too difficult and too expensive”, they said. But they were wrong. Now there’s a safe, manageable, cost effective way to provide easy application deployment, whilst satisfying security and regulatory requirements. It’s called Micro Focus® Reflection® ZFE, a browser based ‘Zero Footprint Emulator’. Monitor and meter: track who’s connecting and when. Now’s a great time to re-visit your terminal emulation requirements and explore how to modernize and secure user access to mainframe systems. Mainframe based systems play a vital role in most large organizations, powering many of the most critical customer-facing business processes. Integrating these legacy mainframe systems with newer cloud based services such as Salesforce delivers productivity improvements for the call centre, resulting in increased customer satisfaction, competitiveness and cost savings. Join this webinar and understand how to integrate Salesforce to Mainframe based legacy applications. Join us to make Salesforce and your Mainframes a winning combination! Traditional green-screen applications are rich in business logic and high in business value. Usability is another story. Clunky, old-fashioned UIs frustrate today’s users and hurt productivity. The typical modernization project is long, complicated, and riddled with risk. But now Micro Focus offers a safe, efficient, cost-effective way to boost business performance with anywhere, anytime access—from desktop, web, and mobile devices.